California researchers are looking for a way to help dwindling bee populations -- all by simply planting a shrub. A new $3 million program by the federal government aims to bolster support for five states -- Michigan, Minnesota, Wisconsin and North and South Dakota -- all of which have large (and valuable) numbers of honeybee colonies, about 65 percent of the country's total. The New York Times reports that the effort is meant to get farmers to plant more crops with pollinators like bees and butterflies, preparing the insects to withstand the threats of pathogens, parasites and pesticides. The new program will encourage farmers and ranchers to grow alfalfa, clover and other crops favored by bees and which serve a second purpose of being forage for livestock. Other proposed changes in practices include fencing property for managing grazing pastures in rotation so that they can replenish, leaving living plants for the bees. "If they have a good nutritional foundation, they can survive some of the things they are faced with," Jeffery S. Pettis, who leads bee research at the federal Agricultural Research Service, told the Times. So far, about 43 million acres of land across the country are implementing pollinator-friendly measure. The measure comes none too soon -- bees are seeing catastrophic population declines around the world, thanks to a combination of problems like parasites, infection and insecticides. Researchers now are encouraging farmers to plant hedgerows with plants that attract bees and other pollinators, both for their own crops and for those of other farms nearby. And there is hope -- with corn prices falling lately, farmers may have more acres available for other types of plants. 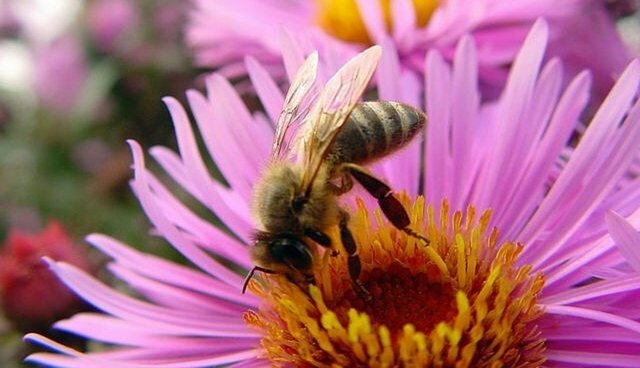 Says A. Gary Shilling, an economic consultant, asset manager and avid beekeeper in New Jersey, "There will be less incentive to plant fence-row to fence-row," he said. So pollinator plantings could make a comeback, especially if social pressure encourages farmers to support bees."